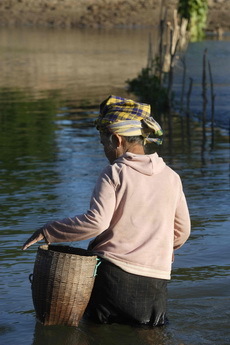 River fish form an essential part of the diet for most people in the project area, but as across the rest of Laos, fish catch is declining along the Nam Theun, Nam Hinboun, and tributary rivers. 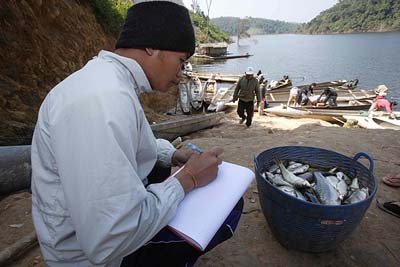 The operation of the first Theun-Hinboun project is likely to have contributed to fish population declines along the rivers downstream of the plant by causing fluctuations in river levels along the Nam Hai and Hinboun. The THPC Fishery Management and Mitigation team works to help the company minimise and compensate for fish catch loss through study of local aquatic ecosystems and management of new and existing fisheries. The creation of the Nam Gnouang Reservoir in particular offers a good chance to offset fish loss in the downstream rivers. In the first year following impoundment, the reservoir has helped substantially improve income among fishing families based on the reservoir, with traders travelling from neighbouring districts and provinces to buy their catch. Experience shows that fish populations in tropical reservoirs can sometimes decline quickly, so the Fisheries team is working with district authorities and two villages, Keosenkham and Thasala, on management of the Nam Gnouang fishery to try and ensure the sustainability of this resource. 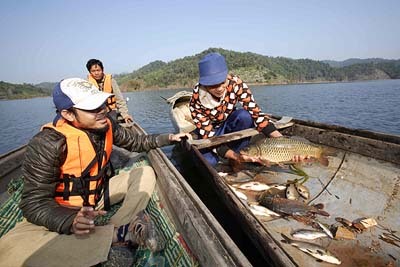 Fishing in the reservoir is regulated by the villagers themselves, following rules set by Village Fishery Groups (VFGs). The THPC team helped villagers to establish these and brought them together with district officials to organise a licensing system. Fishing and fish trading licences issued by the VFGs are required to work around the reservoir and a tax is paid on fish catches and sales. 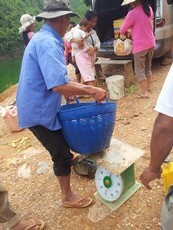 Income from this system is used to fund the management and patrolling of the reservoir fishery by local people. THPC continues to work with the VFGs, studying deep pools for the establishment of fish conservation zones and advising on regulation of fishing. The team also monitors fish catch and trade as well as the aquatic life within the reservoir and along rivers upstream and downstream to ensure that any potential problems with fish mortality and disease are detected early. The THPC fisheries team monitors fish catches around the project area and works on long-term plans to sustain and restore this resource.